South Africa is renowned for its good quality maize and this crop is important to commercial and subsistence farming communities. Although maize has many uses, the most important is that of the production of food and feed. Maize and maize-based products are consumed by the majority of South Africans (between 67% and 83% of the population), and the average cooked maize consumption per day is estimated between 476 g - 690 g per person. For this reason, the contamination of maize by fungi and the resultant production of mycotoxins, remains a very important concern. In the previous article (March 2017) we explained that mycotoxins are toxic chemicals produced by fungi that grow naturally on various agricultural crops. Although the extent of fungal growth on crops can be visible to the naked eye, the occurrence and levels of mycotoxins are not. These levels may vary extensively in a single maize cob, as well as between neighbouring plants. 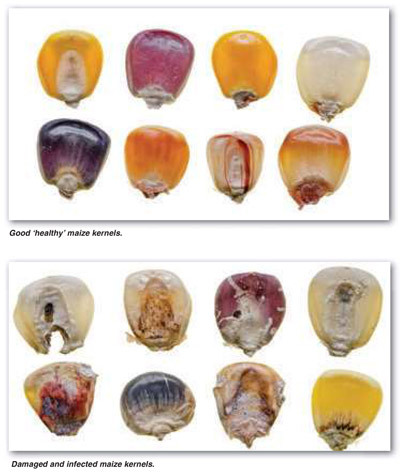 The mycotoxins relevant to commercial maize produced in South Africa are: Fumonisin (FB) associated with Fusarium Ear Rot; deoxynivalenol (DON) and zearalenone (ZEA) associated with Giberella Ear Rot, all caused by Fusarium fungal species. In rural areas in South Africa where people grow maize as a daily staple (subsistence farming), FB has been the most important mycotoxin and normally occurs at relatively high levels. This has been the case for rural Eastern Cape (EC), Limpopo (LP), and KwaZulu-Natal (KZN). DON has also been detected in subsistence maize from the rural EC. The mycotoxin aflatoxin (AFLA), produced by Aspergillus flavus, has been observed in rural LP and KZN. The reasons for these differences in areas include climate, insect pests, soil quality and agricultural practices. Those of you that farm with maize will know that each maize kernel is made-up of different parts (Figure 1) and each of these is of commercial importance. 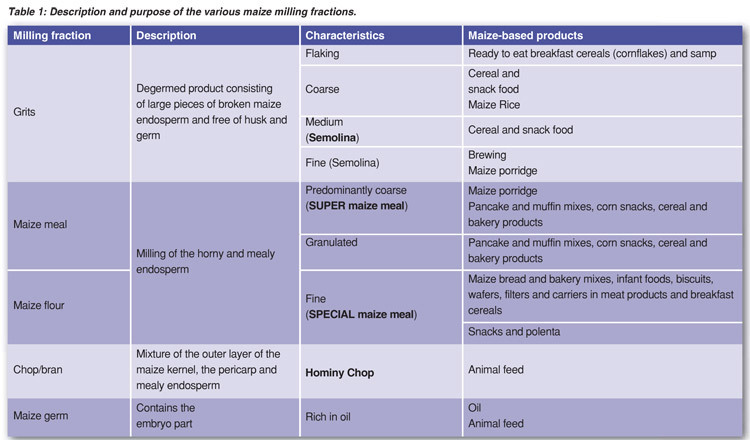 Table 1 provides a description and summary of kernel parts (also known as milling fractions). The Fusarium and Aspergillus fungi are soilborne organisms and usually survive in plant debris (stubble) between seasons. These fungi can infect the plants pre-harvest in various ways: Through the roots or carried over in contaminated seed (Fusarium); wind and water transmission, as well as through insect and other wounds (Fusarium and Aspergillus). Aspergillus is also known to be a serious problem when grain is not stored properly. 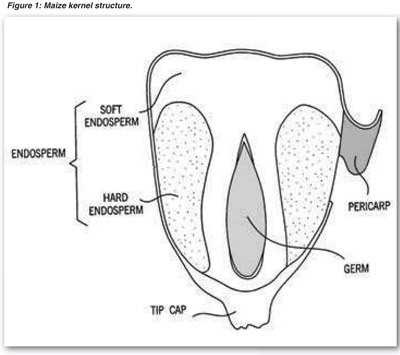 Fungi enter the maize kernel from the outer layers and move to the inner kernel layers, therefore mycotoxins are known to be mainly concentrated in the surface layers of the maize kernel. Furthermore, the pericarp can act as a physical barrier against the fungi entering the endosperm. The chemical structure of mycotoxins makes it impossible to remove them completely from crops and therefore they can only be partly removed by food processing and/or other specific clean-up (decontamination) methods. Food processing that may reduce mycotoxin contamination includes sorting, washing, dehulling, milling, brewing, baking, frying, roasting and alkaline cooking. Milling of maize is a physical process regarded as the first step in the production of maize-based products by removing the outer structure (pericarp) to expose the endosperm, which is then turned into various fractions such as grits; germ; meal and fine flour. The fractions mostly used for the production of human foodstuffs are the grit and flour with their respective particle sizes and grading, whereas the bran and germ milling fractions are mostly used for animal feed and oil extraction, respectively (Table 1). In South Africa dry milling is mostly utilised to produce food products such as samp, maize rice, unsifted, sifted, coarse, SUPER and SPECIAL maize meal. The levels of mycotoxins within the different milling fractions will differ depending on numerous factors such as how the far the fungi have entered into a kernel (surface or inner layers) and the physical breaking of each kernel into its various milling fractions. Due to the complexity of the milling process during which unprocessed maize produces various fractions, the mycotoxin levels may either be redistributed or concentrated. In the next issue we will continue to explore mycotoxins relevant to other grains such as wheat, sorghum and barley. The question of safety levels we will address in a later issue when we will talk about the impact of mycotoxins on human health. Article submitted by HM Burger and P Rheeder from the Institute of Biomedical and Microbial Biotechnology (IBMB), Cape Peninsula University of Technology (CPUT). For more information, send an email to Burgerh@cput.ac.za. or RheederJP@cput.ac.za.